St. Martin's Press, 9780312532468, 315pp. With the Castine investigation in full swing, now is hardly the time for Gunther to go AWOL and join Lyn in Maine. But as more evidence emerges, the less it seems that the Silvas were innocent victims. Turns out they had some involvement with a gang of vicious smugglers--men who will do whatever it takes to keep Lyn and Gunther from finding the truth and who will kill to keep old secrets buried. 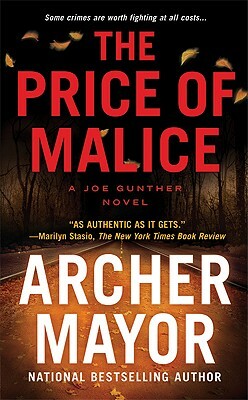 Archer Mayor, in addition to being a novelist, is also a death investigator for Vermont's Chief Medical Examiner, a deputy for the Windham County Sheriff's Department, and has served twenty-five years experience as a volunteer firefighter and EMT. The winner of the NEIBA award for Best Fiction, he lives in Newfane, Vermont.